Just a reminder of how markets in the United States closed yesterday evening. 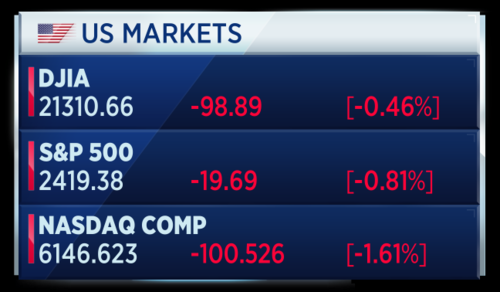 The Dow Jones industrial average pulled back about 100 points, with 3M and Apple leading decliners. The 30-stock index fell after multiple reports said the Senate will hold off on voting on a bill to repeal and replace Obamacare until after the July 4 recess. 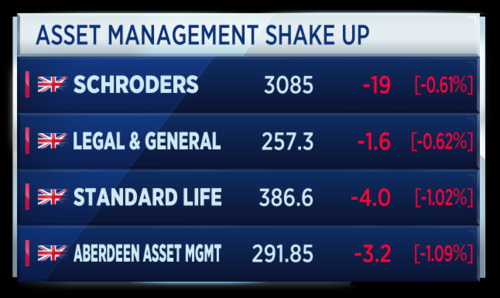 The Nasdaq composite underperformed, falling 1.6 percent, as shares of Google-parent Alphabet declined more than 2 percent. The EU fined Google a record $2.7 billion, as regulators ruled the company violated antitrust rules. 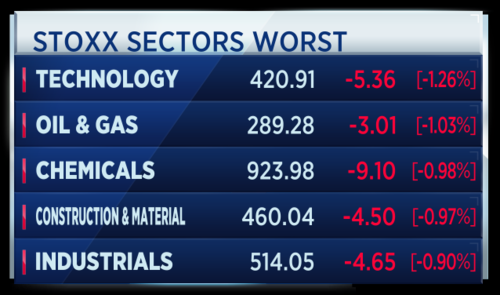 The S&P 500 dropped 0.8 percent. 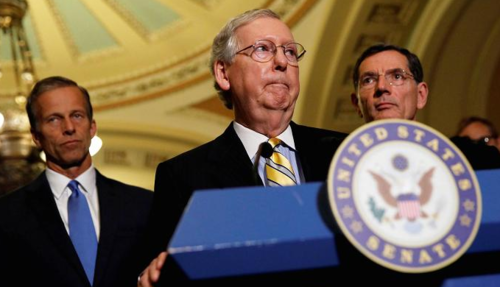 U.S. Senate Republican leader Mitch McConnell says the vote on a healthcare overhaul bill will have to wait a while. McConnell met with President Donald Trump to discuss the delay. The status quo is simply unsustainable. It'll be dealt with in one of two ways. Either Republicans will agree and change the status quo, or the markets will continue to collapse and we'll have to sit down with Senator Schumer and my suspicion is any negotiation with the Democrats would include none of the reforms that we would like to make both on the market side and the Medicaid side. So for all of those reasons we need to come up with a solution. The American people elected us to do that and we're working hard to get there. Republican leaders wanted to vote on it this week, but didn't appear to have the numbers after several in their party expressed reservations. U.S. stock markets fell on the news of the delayed vote. A major global cyber attack has spread across Eastern Europe, causing severe disruption in Ukraine and Russia. 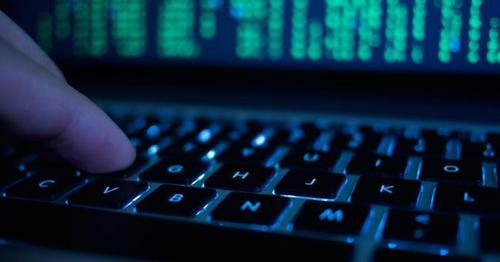 The attack involved malware known as "Petya", locking victims' computers and asking them to pay a Bitcoin-based ransom of $300. The disruption spread to several European companies, including Maersk, Merck, WPP and Rosneft, who all blamed IT outages on the attack. The virus used is similar to the ransomware attack last month that infected more than 300,000 computers, according to cybersecurity experts. In a statement, the US National Security Council said government agencies were investigating the attack. The US Department of Homeland Security advised victims not to pay the ransom..
CNBCA major wave of cyber attack worldwide disrupted computers at Russia's biggest oil company, Ukranian banks and multinational firms. According to the Nationwide survey, U.K. house prices rose 1.1 percent month-on month in June. That a bounce back from the 0.2 percent fall witnessed in May. On a year by year basis, UK house prices were 3.1 percent higher in June. The Financial Conduct Authority (FCA) in the United Kingdom has today published the final findings of its asset management market study. The FCA is claiming that price competition is weak in the market and that it wants to see all-in fees and independent board members introduced into the fund management industry. Despite a large number of firms operating in the market, the FCA’s analysis found evidence of sustained, high profits over a number of years. The FCA also found that investors are not always clear what the objectives of funds are, and fund performance is not always reported against an appropriate benchmark. Finally, the FCA found concerns about the way the investment consultant market operates. Nestle has announced a $20.8 billion dollar share buyback, just days after activist investor Third Point went public with a series of demands. Third Point's CEO Daniel Loeb accused the company of "being stuck in its old ways," claiming that share repurchases are a particularly attractive option at the moment. Nestle says it will focus on capital spending as part of its re-vamped strategy. 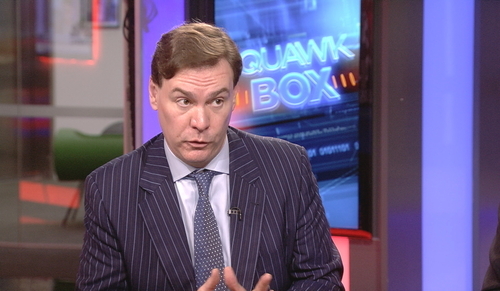 Steven Wieting, Global Chief investment strategist at Citi Private Bank is on set with Karen and Steve. He says with borrowing costs so low, European firms should lever up their balance sheets in a manner that U.S. firms have already done. He says with dividend yields sitting at 3.5 percent then borrowing to enact buybacks is a simple method of positively engineering a balance sheet. French consumer confidence has hit 108 for June versus a forecast of 103 according to official statistics body, INSEE. That is the highest level since June 2007. The Macron effect? The French consumers have expressed their highest confidence in a decade. 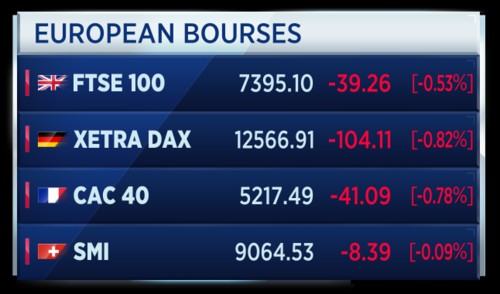 Europe's markets have opened lower. This after "hawkish" Draghi comments pushed the euro higher yesterday afternoon and a global cyber attack infected the computer systems of firms. 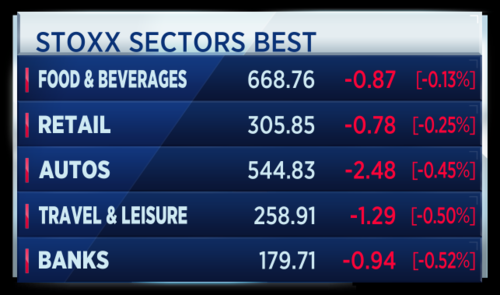 Here are the best and worst of the stocks across Europe this morning. Individual bourses look like this. 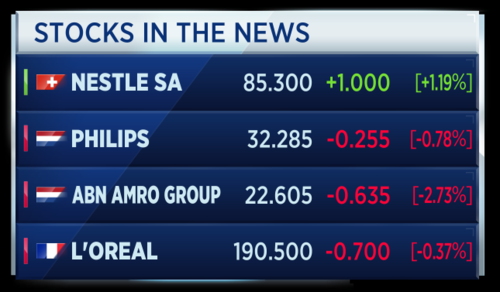 Meanwhile here are some of the stocks on the move. Nestle has announced a 20 point 8 billion dollar share buyback, just days after activist investor Third Point went public with a series of demands. Loeb has pressured Nestle sell down its stake in the French cosmetics group. L'Oreal shares rallied nearly 4 percent on news of Third Point's investment. Dutch medical equipment maker Philips has announced a 1.9 billion euro takeover of Spectranetics. The U.S.-based firm makes medical technology like lasers and drug-covered balloons to solve issues related to heart disease. Dutch government investors are cutting their stake in ABN AMRO bank to 63% from 70%. The Netherlands nationalised part of the financial firm in the 2008 financial crisis. It was partially reprivatised via IPO in 2015. 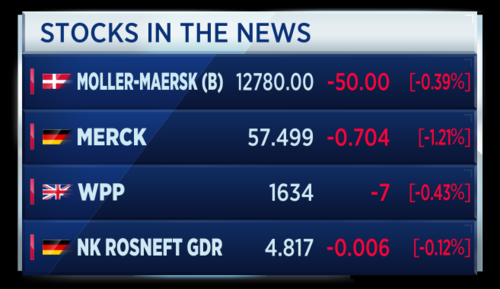 Moller Maersk says shut down a number of systems to help contain issue. The company has been hit as part of a global cyber attack named Petya on 27 June. That's according to Reuters. A major global cyber attack has spread across Eastern Europe, causing severe disruption in Ukraine and Russia. The attack involved malware known as "Petya", locking victims' computers and asking them to pay a Bitcoin ransom of 300 dollars. 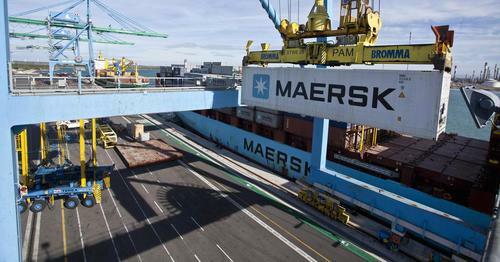 The disruption spread to several European companies, including Maersk, Merck, WPP and Rosneft. The Financial Conducty Authority has called for a shakeup of the UK asset management market. The call comes after the FCA's long awaited reported into the sector. Calling for more transparency, the watchdog is aiming to improve value for money for customers. Not a single sector in the green this morning. Technology is the worst of the bunch which is marrying what was witnessed in the United States yesterday. I think regulators are going in the right direction. Yesterday there was the liquidation of two banks in Italy and there were a lot of critics that this was very different from the deal that happened with Santander and Banco Popolar. I think bending the rules is instrumental in getting the right results and don't inflict pain on the system. There will be two problems with letting banks go. One is retail. In a bail in, it will be a disaster for retail. There are 2 million households and businesses banking with these banks. 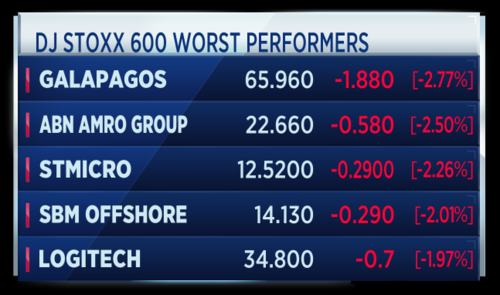 On the other hand there is systemic risks and contagion effects similar to the one happening in Banco Portugal. 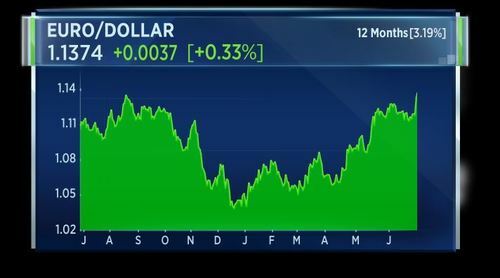 ECB President Mario Draghi boosts the euro to a 12-month high after hinting that tapering could start sooner than expected, but Vice President Vitor Constancio says that market conditions must be right. Shares of Nestle open higher after the Swiss food giant launches a 20 billion dollar share buyback and says it will focus on capital spending, just days after Third Point's Dan Loeb pressured the firm to shake up its structure. Maersk shuts down a number of its systems after hackers strike in another large-scale cyber attack targeting the shipping giant and several other corporations and government institutions across Europe. European Pharma stocks drag after Republican leaders postpone the Senate vote on healthcare reform, in another policy blow to a key part of President Trump's agenda. BNP Paribas says its real estate arm has been hit by global cyber attack, has taken measures to quickly isolate the impact of it. That's according to Reuters. When looking at protecting our networks from attacks like Petya and WannaCry, the focus should be on people and technology. The order of battle includes every citizen and employee. 95% of all cyberattacks are a result of human error. We must provide their employees training to identify and prevent cyberattacks. This training should include traditional education along with active education, like sending phishing attacks or ransomware requests and monitoring which employees take the bait. Corporations need to keep their technical infrastructure as current as possible, even legacy platforms have patches and updates available to protect against a wide variety of threats. Technology is evolving to meet to and counter these threats. Most enterprises are implementing commercially available threat intelligence platforms and cyber analytical capabilities. Artificial intelligence & machine learning are critical to detecting abnormalities and informing analysts for rapid remediation. 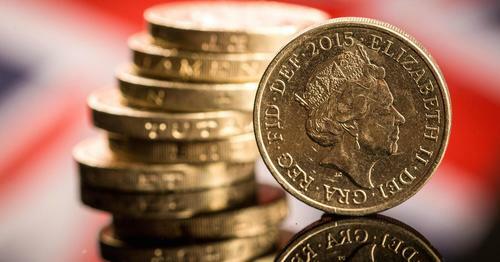 Sterling hit a seven-month low to the euro on Wednesday, losing ground to renewed strength in the single currency after European Central Bank President Mario Draghi hinted the days of the bank's stimulus programme are numbered. 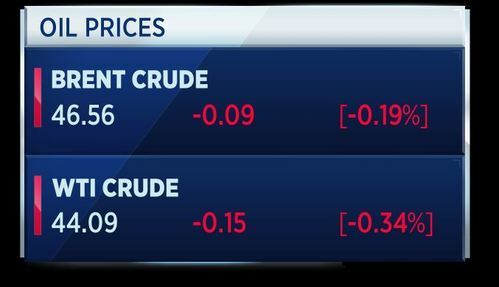 Oil traded further below $47 a barrel on Wednesday after an industry report said U.S. inventories increased, reviving concerns that a three-year supply glut is far from over. The virus being spread in the recent cyberattacks has been given several different names. Some experts say it is a modified version of the "WannaCry" ransomware from May this year, others say it is a modified version of "Petya", which caused problems in 2016. Cisco's threat intelligence service Talos is calling the virus "Nyetya". A new malware variant has surfaced that is distinct enough from Petya that people have referred to it by various names such as Petrwrap and GoldenEye. Talos is identifying this new malware variant as Nyetya. Our current research leads us to believe that the sample leverages EternalBlue and WMI for lateral movement inside an affected network. This behavior is unlike WannaCry, as there does not appear to be an external scanning component. Additionally, there may also be a psexec vector that is also used to spread internally. Talos warns that the virus is able to overwrite a computer's master boot record, then forces the computer to reboot one hour after infection. 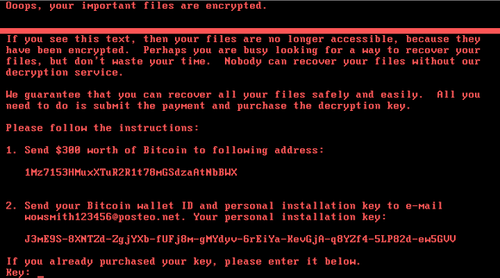 This ransomware locks users out unless they agree to pay a ransom of $300 in bitcoin. The governor of South Africa's central bank has said that the challenges facing his country's ailing economy are now "fundamentally domestic" and will not be impacted by the tightening of monetary policy by the U.S. Federal Reserve or other advanced countries. 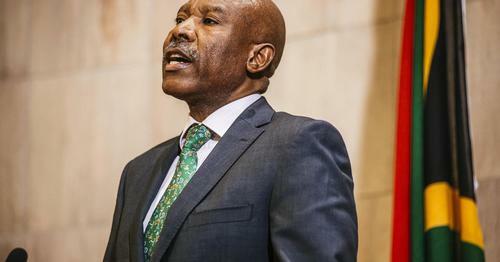 Lesetja Kganyago told CNBC Wednesday that emerging economies, including South Africa, had formerly been heavily impacted by the quantitative easing programs of major central banks, particularly during the 2013 taper tantrum when South Africa was hit with a major outflow of capital. 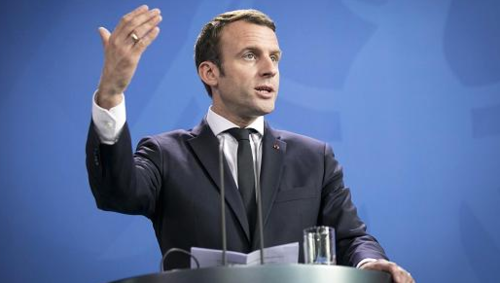 However, with some major economies now showing signs of growth while South Africa's remains in technical recession, he insisted that this co-dependence has no diverged. CNBCThe governor of South Africa’s central bank has said that the challenges facing his country’s ailing economy are now “fundamentally domestic” and will not be impacted by the tightening of monetary policy by the U.S. Federal Reserve or other advanced countries. 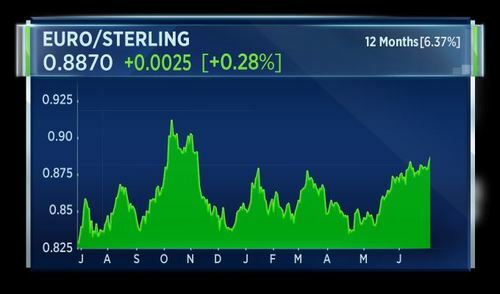 The euro is at multi-month highs against the dollar today. Markets are buying the currency and selling eurozone debt following indications from the ECB that it may start to wind down its trillion-dollar bond buying programme. Jens Stoltenberg, Secretary General of NATO, is discussing the ongoing situation in Afghanistan. I think that we have to remember that the main reason why NATO went into Afghanistan was to prevent Afghanistan from once again becoming a safe haven for international terrorists. We are able to achieve that because terrorists cannot operate, cannot plan, cannot train in Afghanistan in the same way they did before 2001. He adds that the reason for entering Afghanistan was the terror attacks of 9/11, which triggered the Article 5 of NATO, the doctrine of mutual defense. 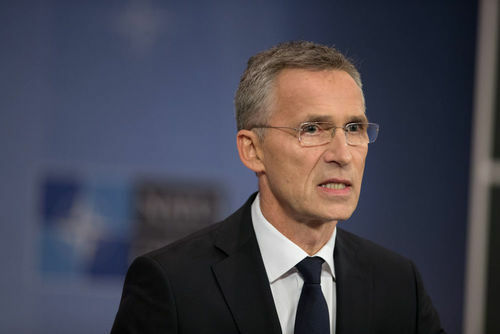 Jens Stoltenberg, Secretary General of NATO, says he will not comment on the internal decision making in the White House administration, but says there is political oversight and control over decisions. I spoke with Secretary Mattis, the Secretary of Defense, and I will meet him again tomorrow, and he is very into the details. He knows NATO, he knows Afghanistan very well. I am absolutely certain that he is following these issues very closely, because he understands that military issues in Afghanistan are also of political importance. The cyberattack hitting Europe locks users out of their computer unless a $300 ransom is paid (via bitcoin). So far, the hackers behind the attack have amassed a total worth just $9,620. Those behind the cyberattack affecting Europe have only succeeded in receiving a total of nearly 4 bitcoins, worth just $9621. Monsanto reports third quarter earnings per share of $1.90, with a gross margin of 56 percent. Net profit was $843 million on sales of $4.23 billion. The company expects to close out the full year with a return to growth and sees full year earnings per share at the high end of the range of $4.09 to $4.55. U.S. advance May goods trade balance comes in at minus $65.9 billion. Advance May wholesale inventories grew 0.3 percent. Advance May retail inventories excluding autos also grew 0.3 percent. The ECB's Ignazio Angeloni says concerns that liquidation under national rules of Italy's Veneto Bank may set a precedent to sidestep EU rules must be taken seriously, Reuters reports. Angeloni says the European banking union is incomplete and therefore fragile. 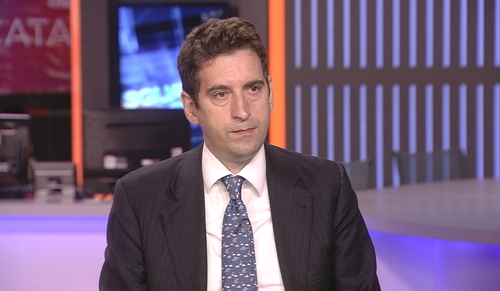 He urges the EU Commission to holde "systemic reflection" on the way Vento Bank's crisis is handled. He adds that, if possible, banks must reallocate securities subject to bail-in institution investors, not retail investors. Several firms across Europe have been affected by the modified Petya malware virus, which locked users out of systems in order to extort a ransom. Ryan Rubin, managing director in Protiviti's EMEA security & privacy IT technology consulting practice, says the affected organisations were fortunate the attack was not more sophisticated. Given the access the malware has, more damage could have been done to these organisations to impact the confidentiality and integrity of their business. On a positive note, It is great to see the security community coming together to promptly dissect the attack and share research into the malware causing this attack. This will help wider organisations affected by the threat understand and respond quicker and enable those not yet affected to take appropriate action to minimise disruption. On a negative note, in many cases, the impact of this attack could be significantly reduced through sound basic security practices. Organisations need to be agile enough to learn from lessons in the past and react and respond quicker to emerging cyber threats. Rubin adds that the attack appears to be motivated less by cyber crime and more on spreading itself in order to cause disruption. 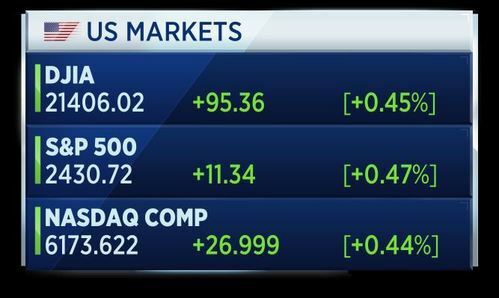 U.S. markets open solidly higher, recovering some of the losses incurred in yesterday's session. 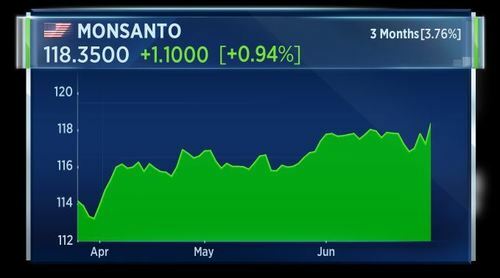 Monsanto shares are up almost 1 percent, hitting a 2-year high in early trading following the release of its latest earnings results. The company achieved $4.25 billion in sales in the third quarter. 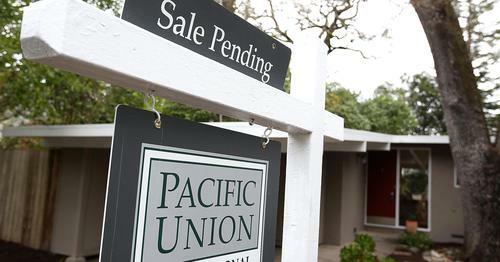 Pending home sales index for May falls 0.8 percent to 108.5. They were seen 0.8 percent higher. Last month, sales fell 1.3 percent. Pending home sales are down 1.7 percent from May 2016. The pending home sales index from the National Association of Realtors dropped 0.8 percent month-to-month and is now 1.7 percent lower than May 2016. 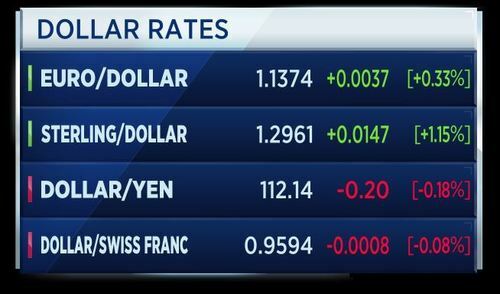 The weaker than expected U.S. home sales data has caused the dollar to slump against other world currencies. The dollar fell to a 1-year low against the euro. It also hit a 7-month low versus the Swiss franc of 0.958 francs. Weekly U.S. crude stocks data is out. Weekly crude stocks built up 118,000 barrels to 509.21 million barrels. That's against an expected draw of 2.6 million barrels. 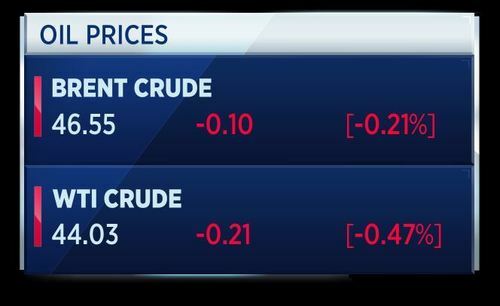 Oil prices reverse earlier gains to turn negative on the news. Support for a high tax, high fiscal spending system is growing in U.K., according to the British Social Attitudes survey, conducted by the National Centre for Social Research. It found that 48 percent of survey respondents wanted increased taxation to allow for greater spending, an increase of 11 percent. That's despite more people voting for the fiscally conservative manifesto of the Conservative Party than the tax and spend manifesto of the Labour Party in the recent U.K. general election. What a difference 20 days makes. After seven years of Conservative government-led austerity, a new survey suggests that public sentiment in the U.K. could be changing gears. Jim O'Sullivan, chief U.S. economist at High Frequency Economics, has weighed in on the weaker-than-expected pending home sales data. He highlights that new home sales are starting to recover. National Association of Realtors officials continue to cite low inventories as a factor holding down existing home sales. New home sales have generally been showing more growth than existing home sales recently; they were up 8.9% y/y in May. Also, existing home sales, based on final contracts, have been somewhat stronger recently than implied by the pending home sales index. Existing home sales are up 3.6% from a year earlier, on average, over the last 12 months (through April), versus a 0.4% gain, on average, in the pending home sales index during that period. The sales data caused the dollar to slump against other currencies. 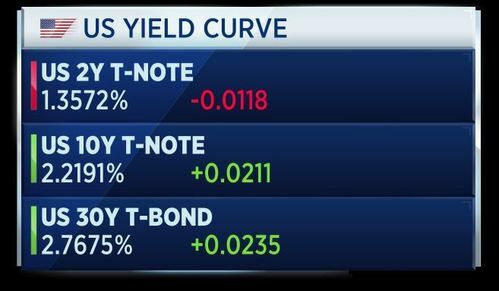 Bonds were also sold off; the yield on benchmark 10-year Treasuries rose around 4 basis points, although bonds are starting to pare losses. Short-dated debt yields are lower. 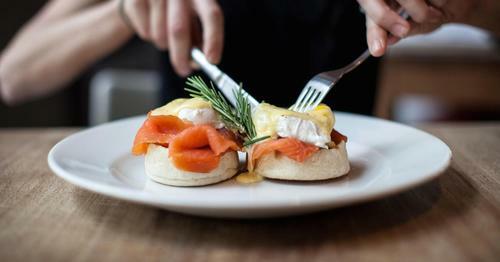 Eating out is notoriously expensive and a new study suggests millennials are eating out too much, preventing them from developing a savings habit. The study also finds 29 percent of millennials are buying coffee at least three times per week..
Millennials are eating up their savings. President Donald Trump has accepted an invitation from French President Emmanuel Macron to visit France during Bastile Day on July 14th. 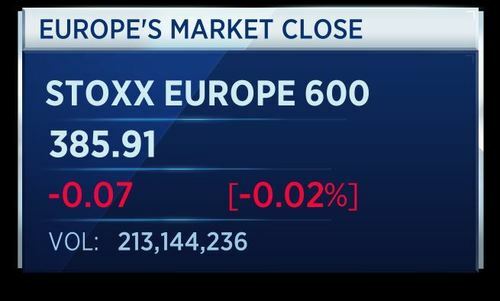 European markets are now closed. 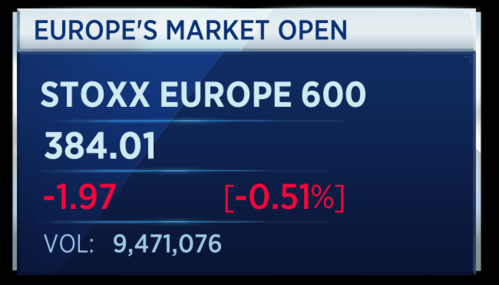 The pan-European Stoxx 600 finished the session flat. The performance of individual markets was much more mixed. 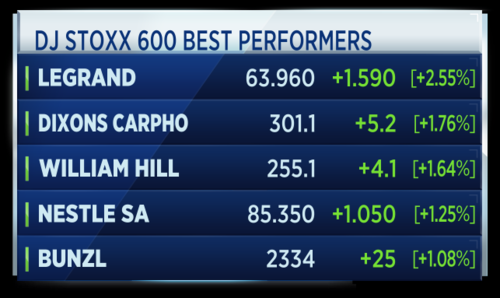 The FTSE MIB rose more than 1 percent, while the German DAX and French CAC finished flat.